There are very few silhouette artists around nowadays. There used to be one I worked with on Central Pier, Blackpool years ago. His name was Lester. He used to do cigarette tricks I remember. Anyway, I was told that Vernon was just as well known among silhouette artists as he was among magicians. I was sceptical about this so I decided to test it. A few years ago I was wandering around some exhibition or other and lo and behold I saw a silhouete artist. I asked if she had ever heard of Dai Vernon. She surprised me by saying, "Oh yes of course! Did you know he was a magician too?" It was the word "too" that made me realise that to her this was a very secondary activity. I was amused by this at the time. 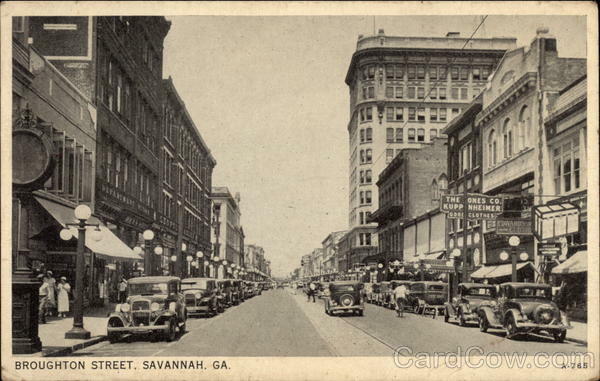 Vernon once told me that he had cut silhouettes on Broughton Street here in Savannah. David Ben gives the date as Dec. 4, 1929. I would be interested if anyone could tell me the exact address of the Broughton Street storefront from which Vernon worked. Sorry, Brad -- I don't know of any Savannah newspapers online that would answer your question. I have seen a silhouette artist as The Magic Castle on different nights, cutting silhouettes for members and guests. Cassidy Alexander, is a very busy silhouette artist in the greater Chicago, Il. area. Appears to be a simple typo rather than an honorific, since the article later refers to him as "Mr. Vernon"
Is the distinctive Vernon signature in the OP, with the elongated 9 and the loop at the end of 'Vernon" way above the line (or is that a "D"? ), the usual way Vernon signed his silhouettes (or other things for that matter)? Compare the signatures to the ones in these auctioned silhouettes. John Carney has a great story about a silhouette that I believe he posted somewhere here on Genii. Maybe he will post it again. From a 1938 interview in the Houston Chronicle with Irving Lunt, a contemporary Texas silhouette artist: "Vernon of New York is the tops in silhouette cutting in the United States. We silhouette artists all dream of some day attaining the skill and speed of Vernon."